Skytrax awards stars to airports, similar to the familiar hotel ratings, for the quality of service, the overall experience, and the efficiency of the handling processes, to rank international airports in terms of passenger comfort. The highest rating – five stars – was previously awarded only to four Asian airports: Singapore, Seoul, Hong Kong and Tokio-Haneda. To join the exclusive group of five-star airports, Munich Airport launched a comprehensive quality campaign in 2013. Waiting areas were upgraded with comfortable seating and lounge chairs as well as USB outlets for mobile devices. To make it easier for passengers and visitors to find their way around the airport, 13 InfoGate counters are positioned at various locations in the terminals, allowing passengers to connect live via video conference with information service staff. And at the approximately 70 InfoGate terminals, information on flights, navigation in the airport, shopping options and other services are available by touchscreen. 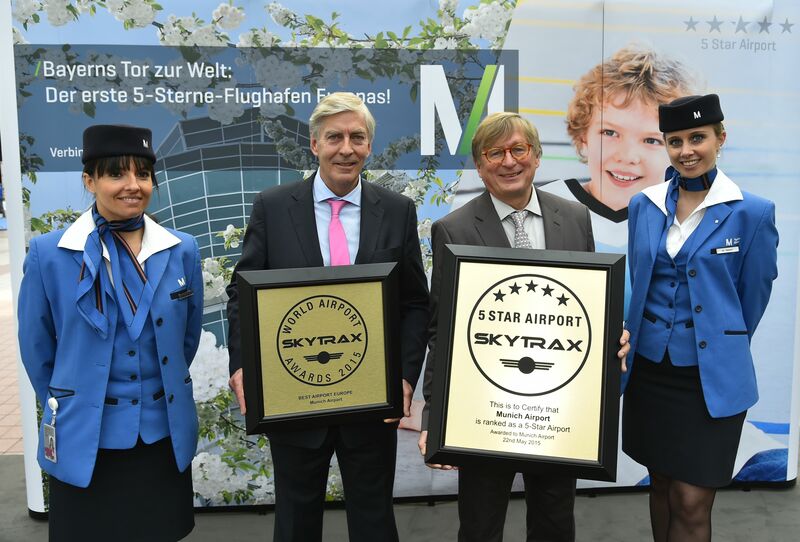 In an audit at the end of March of this year, the Skytrax specialists spent several days evaluating the success of the various optimization measures before granting Munich the coveted “Five-Star Airport” seal of approval. Munich Airport’s top ratings were also reflected in the views of passengers who took part in the global survey for the World Airports Awards 2015. In this annual survey conducted by the Skytrax Institute – this year with more than 13 million passengers responding – Munich repeated last year’s success, with the number one ranking in Europe and the number three position in the global table. This marked the eighth time in the past 10 years that Munich Airport has made news as the Best Airport in Europe.